Do you get hungry whenever you see something that is associated with food? 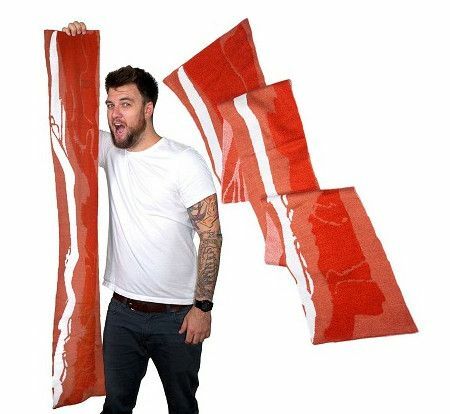 If you have answered in the affirmative, then you might want to check out the $15.99 Bacon Scarf, which looks crispy and delicious, although it will not emanate any kind of smell to whet your appetite. The thing is, the Bacon Scarf is there to keep you nice and warm, measuring approximately 53″ in length and is made out of acrylic knit. It works best if you wear it around your neck, as frying it does not come recommended. After all, bacon is one kind of meat that many will find it difficult to resist. To make it more enticing, the way it has been printed certainly gets me drooling at the very least. It is time to go fix myself a sandwich now!